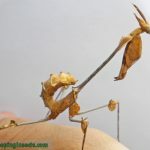 The Wandering Violin Mantis is one of the most amazing looking mantis species. 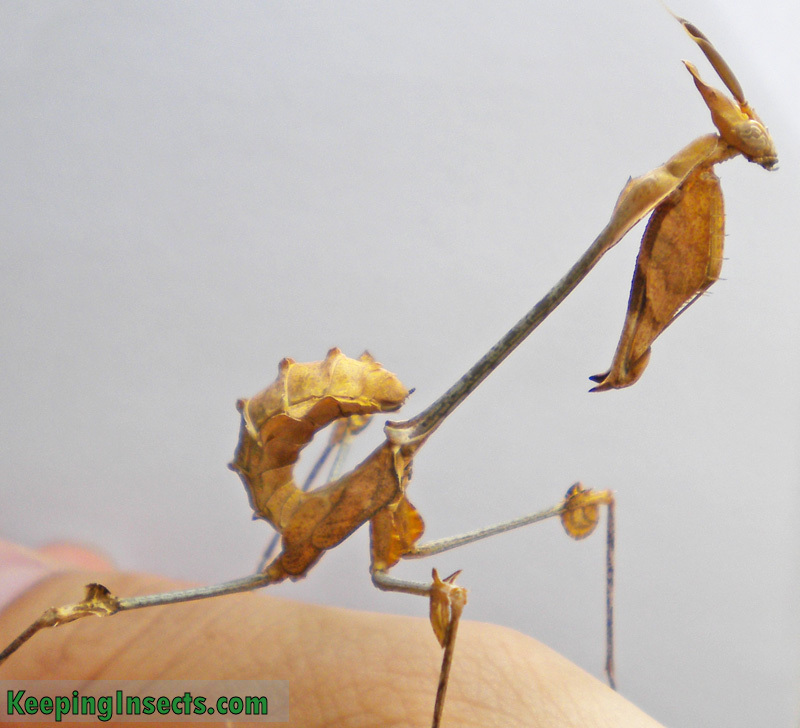 It is a large mantis with amazing camouflage. 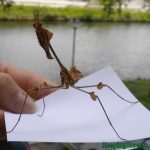 It’s body has a lot of appendages that look like dried leaves and its body is long and thin to resemble a wooden stick. 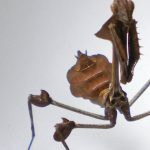 The Latin name of the Wandering Violin mantis is Gongylus gongylodes. 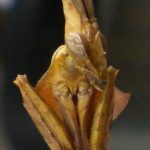 Gongylus gongylodes natural habitat is in India and Sri Lanka. 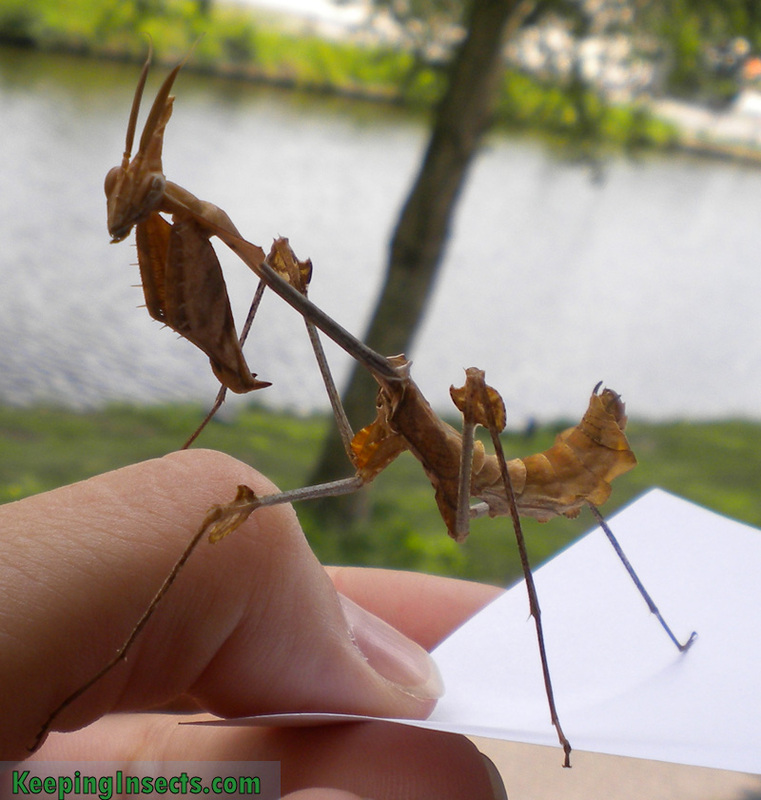 It’s not an easy mantis to keep as a pet, but it’s amazing to see it. 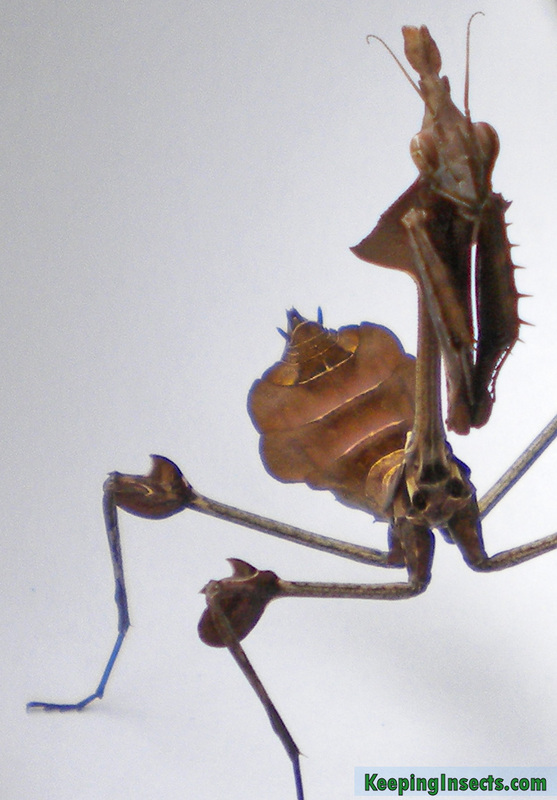 The Wandering Violin Mantis got its name because the adults look a bit like a violin. 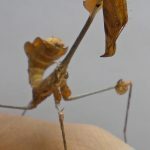 Their body would resemble the soundboard of a violin, the head would be the top of the violin and the long and thin midsection of the mantis would be the neck of the violin. 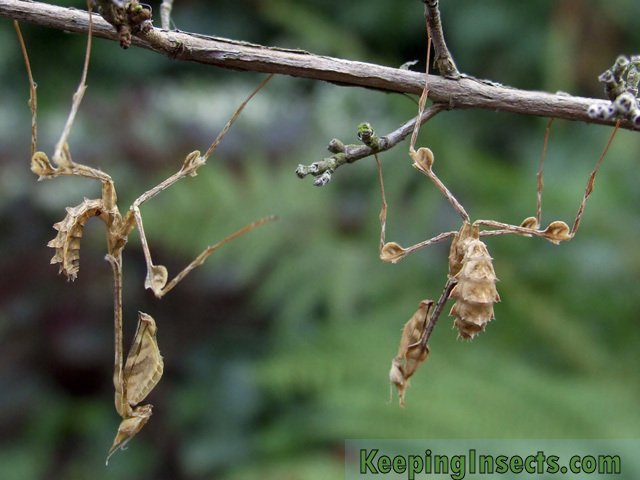 Gongylus gongylodes comes in different color variants ranging from light brown to dark brown. 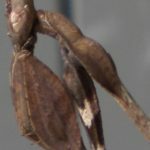 Its body has all kinds of appendages that resemble dried leaves. 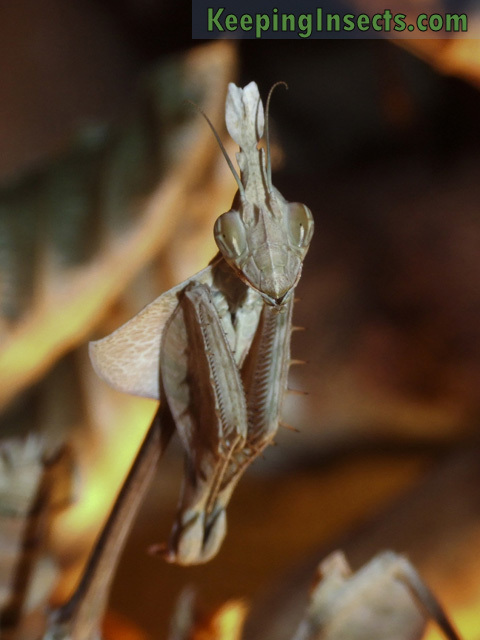 This serves as camouflage for the mantis. 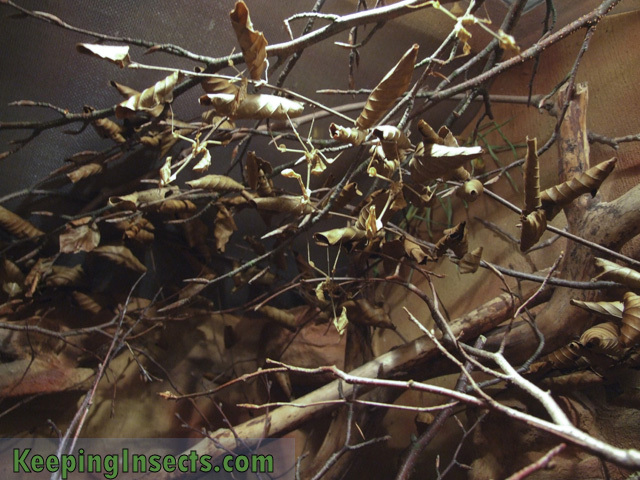 Young nymphs have less pronounced camouflage than the older nymphs and adults. 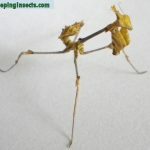 Females will reach a body length of 10 centimeters, males will reach a length of around 9 cm (3 inches). 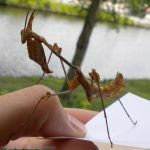 When the nymphs are born they already resemble the parents in body shape. Their color is light brown. 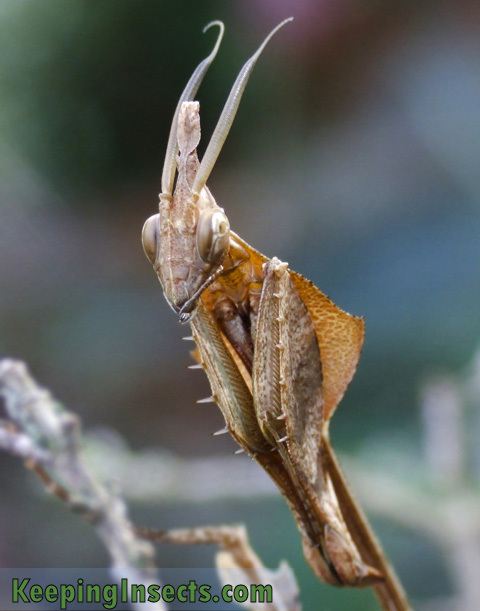 This mantis species is a quit mantis, a typical sit-and-wait predator. It won’t move around a lot. It’s not aggressive at all, but can be easily intimidated. 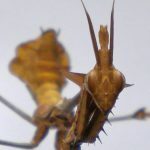 The adults or subadults will show a deimatic display when they feel threatened; they will raise their front arms and show a black and pink spot. This is supposed to scare away predators. 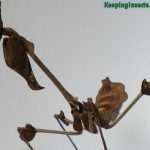 Young nymphs will not do this, if threatened they will try to run. 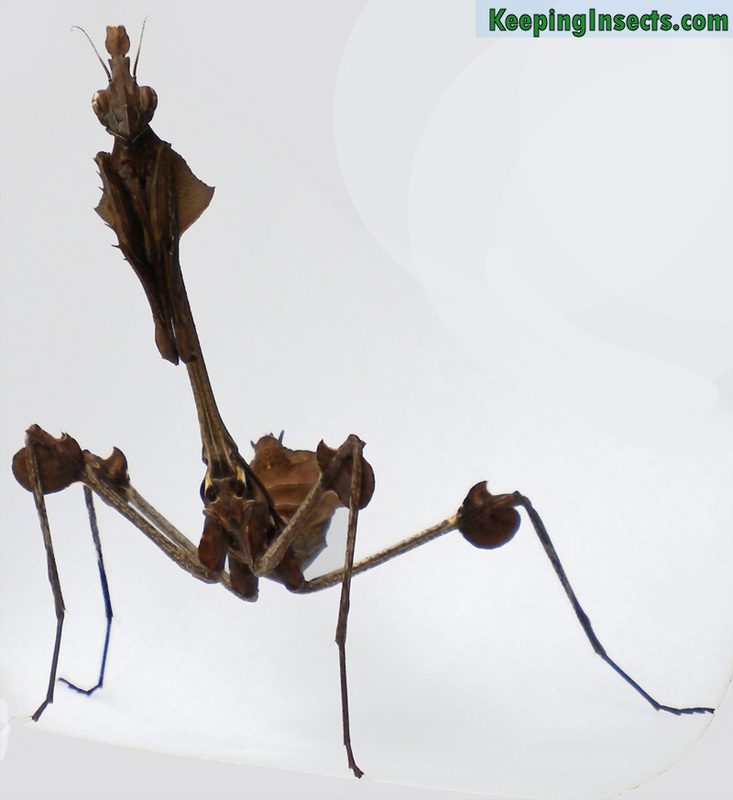 The Wandering Violin Mantis is specialized in catching flying insects. 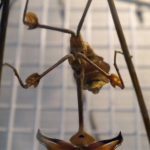 It can grab a fly straight out of the air! This is one of the few mantis species that can be kept in groups safely all their lives. They prefer to eat flying prey and will therefore leave each other alone. Don’t misunderstand this, when hungry they will definately turn to each other. 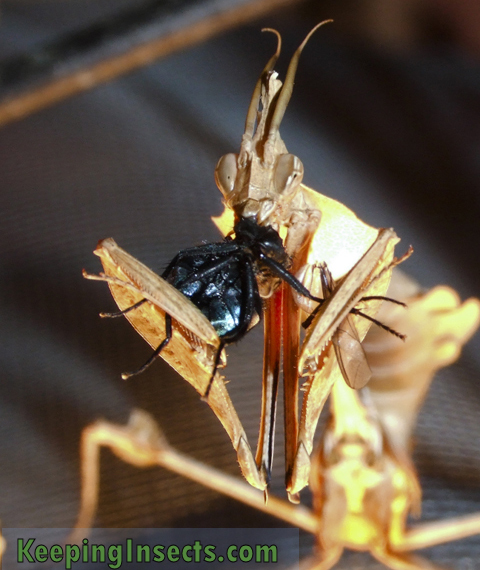 Cannibalism can happen when there is not enough food, especially if the mantises are still young. 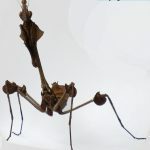 The Wandering Violin Mantis needs special environmental conditions. It needs high temperatures and low air humidity. The ideal temperature is 35 °C, but you could vary between 30 °C and 40 °C. In the night the temperatures are allowed to drop to around 20 °C. Heating with a lamp is the best option for this species. 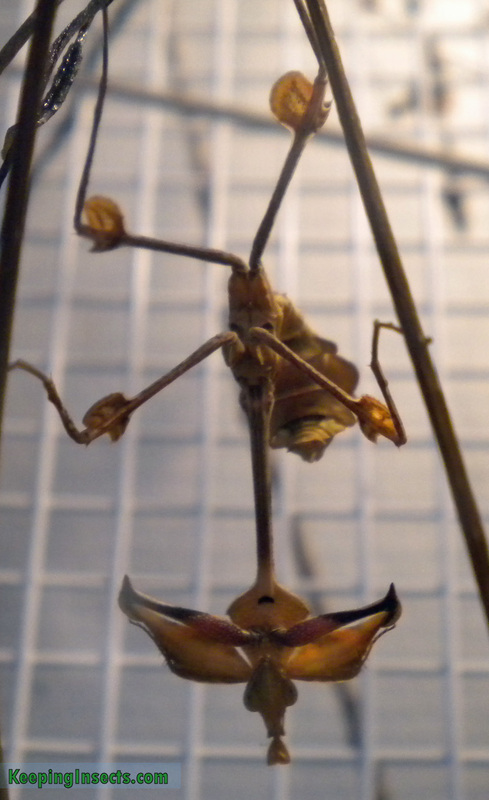 If you keep this mantis in a net cage you can spray water every 3 days. If you keep Wandering Violins in a glass cage you can spray once a week. 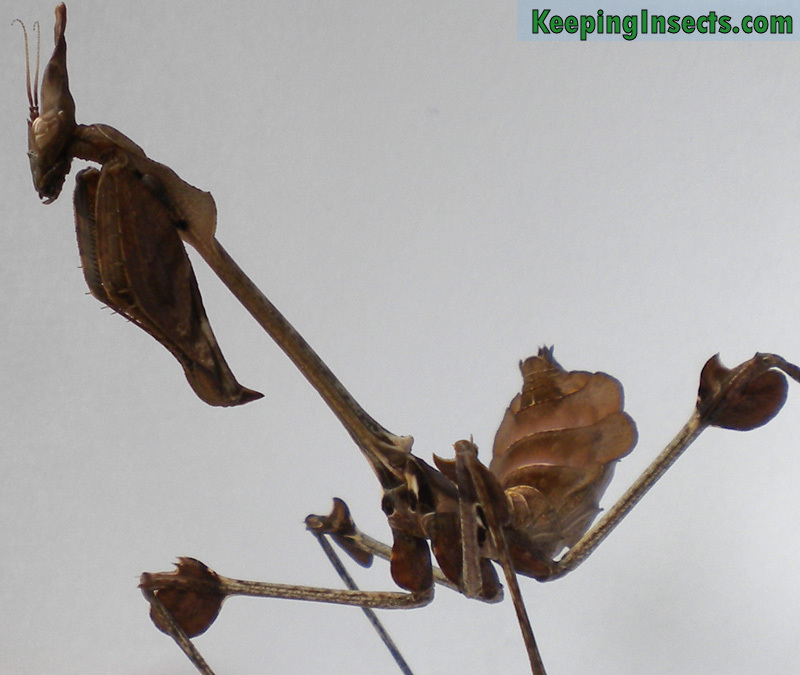 This mantis species is specialized in eating flying insects. It will generally not chase crickets or other crawling bugs. 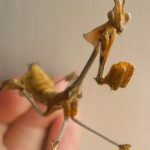 It’s even likely that feeding crickets with tweezers to Gongylus gongylodes will result in bad health for this mantis. 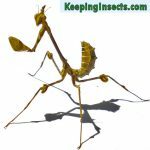 Feed your mantis live flies; first fruit flies and when the mantis gets older you can feed it house flies. 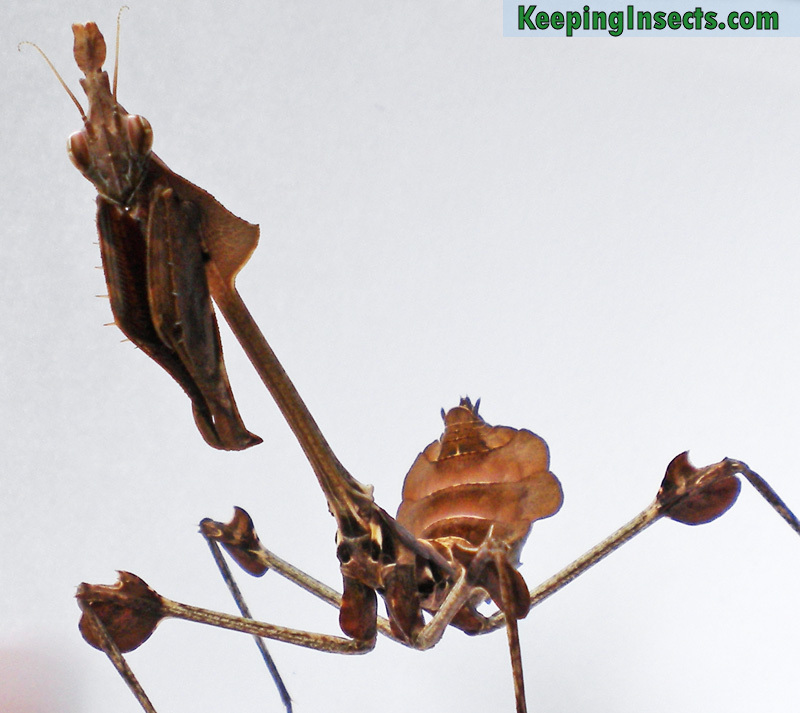 Make sure this mantis eats every day or at least every two days. 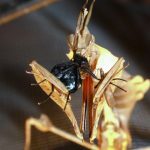 Don’t put a crazy amount of flies in the enclosure, if the mantis is no longer hungry a lot of flies flying around can make the mantis stressed. 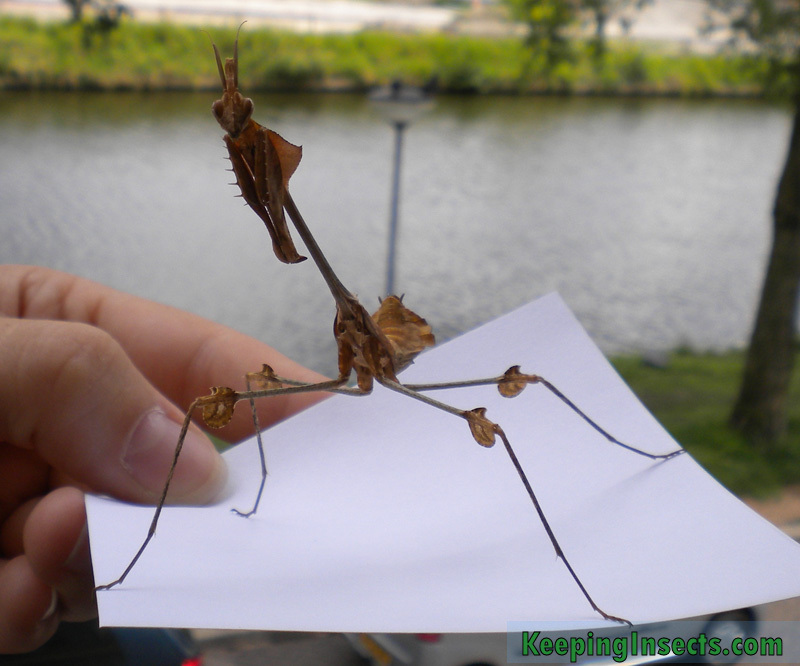 Because the Wandering Violin Mantis can live in groups all its live, breeding is simple! If you manage to get healthy adults, that is. 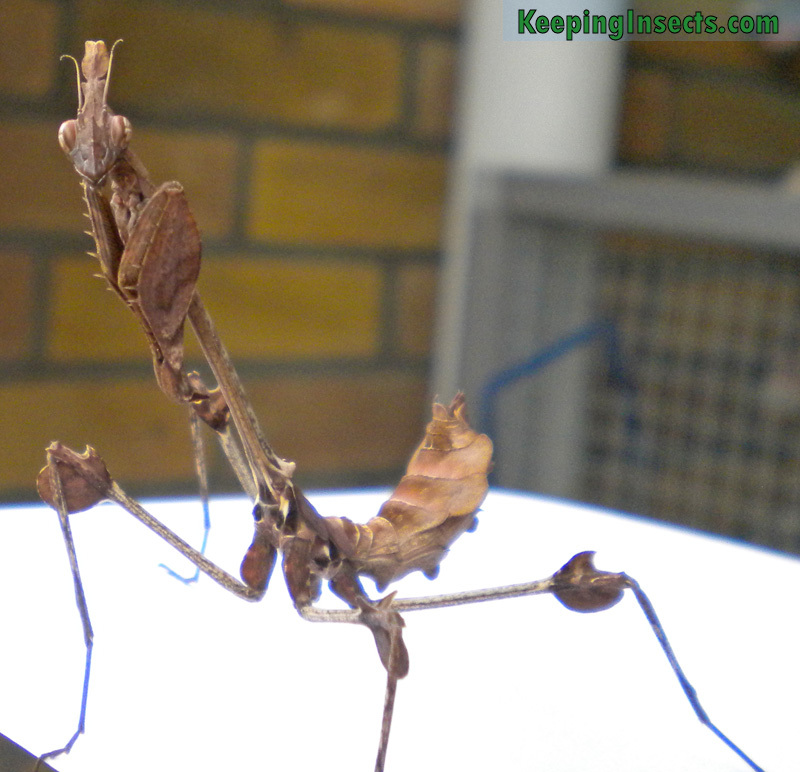 It can be hard to raise this mantis species because they are very sensitive to temperature, food quality and humidity. 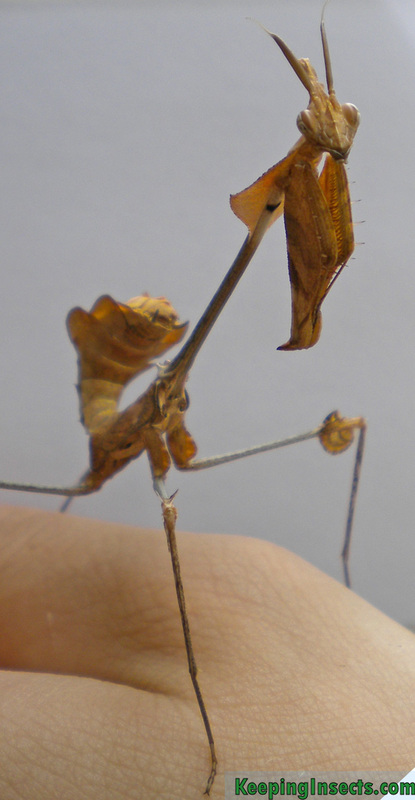 You can easily see the difference between male and female Wandering Violin Mantises. 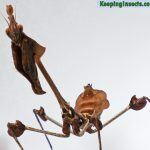 As young nymphs it’s impossible, but when they get older their bodies change. 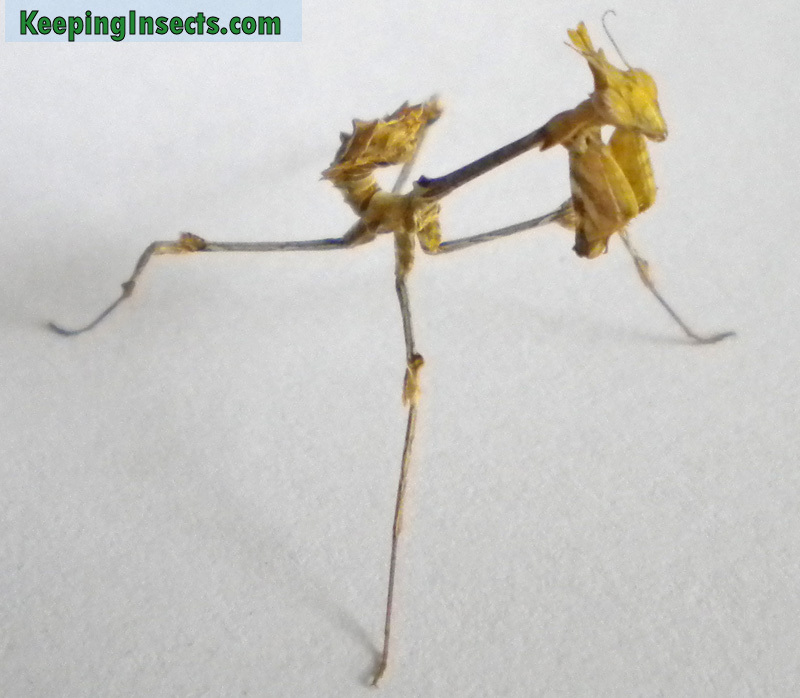 The older female nymphs are a bit more bulky and have short antennae. 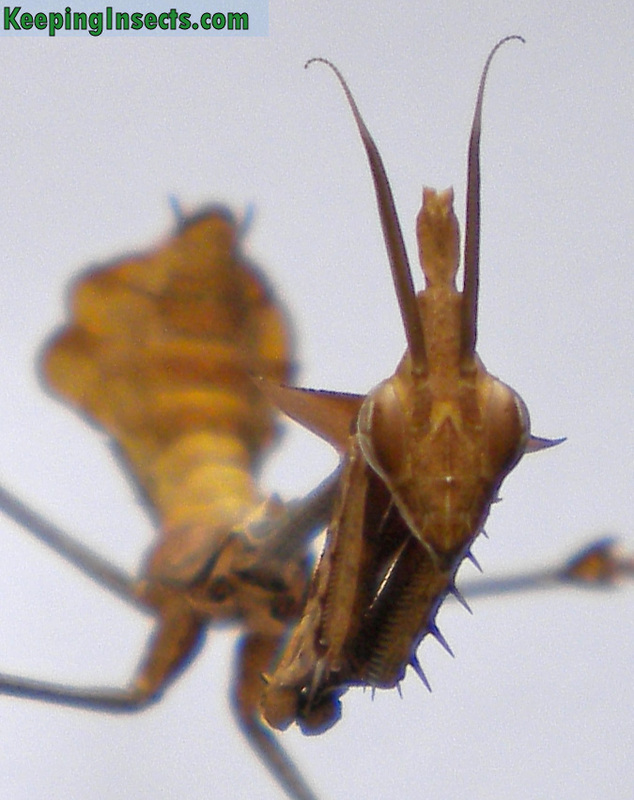 The older male nymphs are more slender and have thick long antennae. 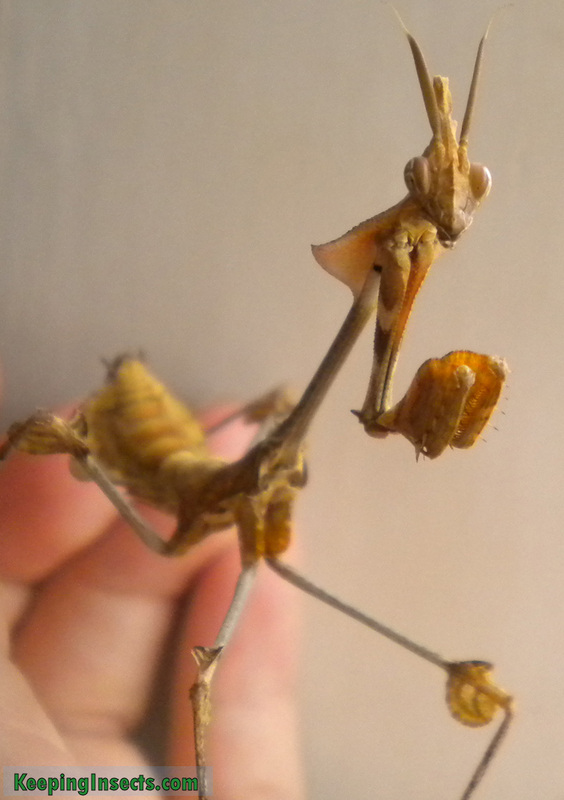 When adult the antennae are very different; the female kept the same short antennae but the male will get huge feathered antennae. 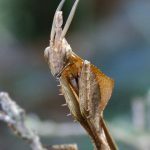 The adult males are also thinner and more slender than the females. 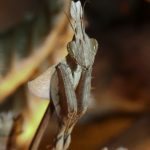 If you have a male and female Wandering Violin Mantis in the same enclosure, they will mate when they are adult for at least 2 weeks. 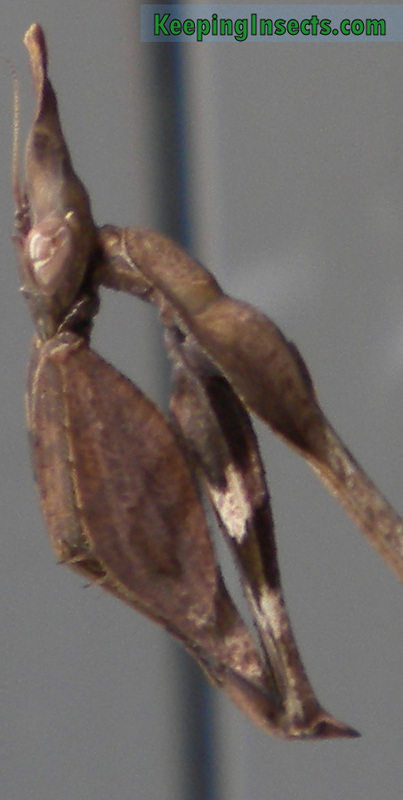 After mating the female will lay egg sacs called ootheca. 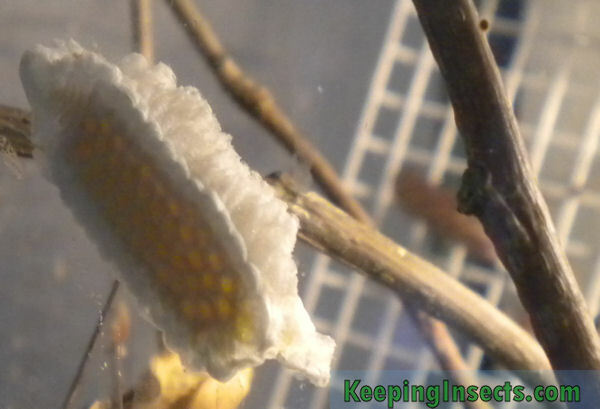 Every ootheca has around 30 to 40 eggs. 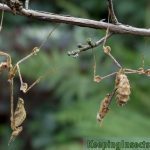 She does not need to mate again after the first time, once mated she will store the sperm to fertilize all her future eggs with. 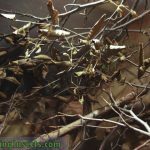 Keep the ootheca the same as the adults, but make sure to keep the air humidity a bit higher around the time of birth of the nymphs. 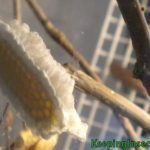 It will take 4 to 7 weeks before the eggs hatch.